The included case is very nice too. 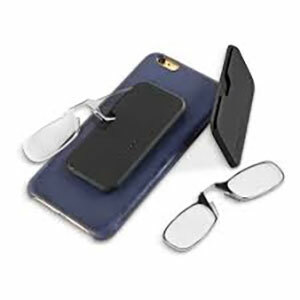 The glasses themselves weigh less than a nickel because they are made with durable optical grade polycarbonate. This keeps them light and helps recede scratches. Since they are right there on your device, they are ready to use anywhere! 44 million Americans need help seeing their screens and 79% of smart phone users have their phones within reach for all but 2 hours of the day. They are available in +1.75 and +2.50 optical strength.